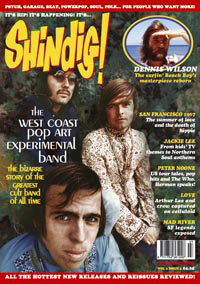 The latest issue of Shindig! (volume 2, issue 5) is now available, packed with the usual blend of reviews and features for the discerning music fan. Highlights this month include the first part of the West Coast Pop Art Experimental Band story, the final part of San Francisco ’67 plus Mark Fry, Dennis Wilson, Love, Jackie Lee, The Pink Fairies, Mellow Candle, Beep Seals, Magnificent Brotherhood, psych jazz and psychsploitation movies – the latter looking worth the entry fee alone. There’s also talk of an annual for the end of the year – you can register your interest for that (as well as finding out where to buy the magazine) at the Shindig! site.